BBC NEWS | Health | How big a threat is MRSA really? During the recent election, it might have seemed as though every other story in the news was about MRSA and what should be done about it. Hearing about teenagers and two-day-old babies who have died after becoming infected with the superbug is shocking and concerning. Any MRSA death is one too many, and nobody wants to become more ill by going into a hospital. But how big a threat is MRSA really? 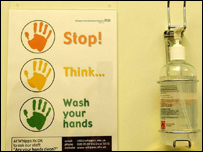 Each year about 300,000 people, or nine in every 100, who go into hospital will pick up an infection there. Of these, about 5,000 will die. 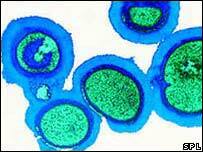 MRSA is the cause in a fifth, but other bugs are to blame for the rest, official statistics suggest. Isolating infected patients and ensuring staff clean their hands regularly will help, but experts estimate only about 15% of infections would be prevented by such measures. MRSA infection is not just confined to hospitals. Outside hospitals, people may carry MRSA without it causing harm to themselves or others. It is one of many forms or strains of a bacterium called Staphylococcus aureus. Dr Jodi Lindsay, lecturer in infectious diseases at St George's hospital, said: "Lots of people carry Staphylococcus aureus up their nose. "About 20-30% carry it up their nose all of the time and another 50% carry it occasionally. "It lives up your nose and is meant to be there. It has evolved with us and is part of our normal bacterial flora. "It does not cause disease normally. It is what we call opportunistic - it has to be put in the right situation to cause disease. It needs to be transported to an open wound for example." When these bacteria do cause disease, most healthy people can shake off the infection naturally and may not even realise that they have had it. Most strains can be treated with commonly used antibiotics if needed. But some strains have become resistant to certain antibiotics, such as MRSA which can no longer be treated with the penicillin-like antibiotic methicillin, from which it gets its name (methicillin-resistant staphylococcus aureus). Technically, MRSA has been around since 1961. But it was not a problem until the early 1990s when the rates began to rise. Experts think that it might have been because there were two new strains that emerged in the UK - EMRSA 15 and EMRSA 16. These two strains seem to be extra good at surviving in hospitals. The rates of EMRSA 15 and 16 have been pretty stable for five years or so and we are beginning to see a drop. And MRSA can be treated with other, more expensive antibiotics. Dr Lindsay said: "Most patients who get an MRSA infection in hospital do all right. "But some people get worse and can't clear it even with the antibiotic that we have got left to use against MRSA, which is called vancomycin. It's a bit more toxic and some patients don't respond and we don't know why." These tend to be patients who are very young or old and have other medical conditions that make them frail. Only cases of the most severe MRSA infections - blood poisoning or bacteraemias - are recorded in official data, which makes it difficult to assess the real extent of infection. The number of death certificates mentioning MRSA infection has increased each year from 1993 to 2003 in England and Wales. Between 2002 and 2003, mentions of MRSA on death certificates increased by 19% but laboratory reports of MRSA compiled by the Health Protection Agency only show an increase of 7%. This suggests that some of the recent increase in mentions of MRSA on death certificates may be due to improved levels of reporting, possibly brought about by the increased public profile of the disease, according to the HPA. Dr Mark Enright of the University of Bath said publicity had raised people's perception of risk. "It is still relatively rare to pick up an MRSA infection, and especially a life-threatening infection is quite uncommon. "Every hospital gets them, but they are turning over vast numbers of patients each year. "It should not stop people from going into hospital. "The actual risk is low, but the public perception of risk is higher because of the things they see in the media." Dr Stephen Barrett, from Imperial College London, said: "The problem in my mind is people get fixated on MRSA and have this idea that if you get rid of it there would not be any more hospital acquired infections. "This, of course, is not the case. We have just got far more patients in hospital who are sick and have had more things done to them than happened in the past and if it wasn't MRSA, they would probably have picked up something else anyway. "We should be concentrating on good hygienic practices rather than just chasing MRSA." Dr Lindsay said it was also possible that many, many more people are catching MRSA, but for them it is not a big problem so it is never reported or recorded. She said what was worrying was that over the last couple of years in the US, people in the community have been catching a particularly nasty type of MRSA, called community acquired or CA-MRSA, that is different to the type we have in the UK. They have typically manifested as skin infections, such as pimples and boils, in otherwise healthy people living in crowded conditions. "The other thing we are worried about is that the first fully resistant strains against vancomycin as well have been described in the US," she said. Thankfully, neither are an issue in the UK yet.